The photo of the snow-covered soldiers, which was used to demonstrate patriotism and help Armenian soldiers serving on the frontline, turned out to be fake. The soldiers weren’t Armenian and weren’t at all in the location identified in the accompanying text. 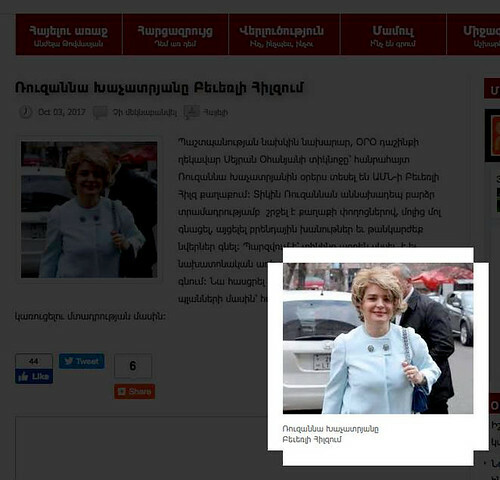 It’s enough to look at the photo carefully to see that behind the woman is a car with Armenia license plates. And in the distance are red Coca-Cola umbrellas. Believe me, you won’t find such cheap cafés in Beverly Hills. You can’t even park your car there if you don’t have special permission. Of course, it may be that the official is with his wife in California, but the issue is that the fake photograph does not inspire trust in this “hot” news story. In December, news spread that many sheikhs from the UAE had visited Armenia. The news was accompanied by a photograph depicting Kuwait’s sheikh, in summer clothing. Such manipulations are widely spread in the media space. So widely that Pope Francis has called the spread of fake news a “very serious sin” that harms all those involved. Urging numerous editors of numerous news sites and media outlets to stay away from fake photos, I came to a sad conclusion: calls to maintain professional ethics are pointless, since the majority of these people are not professionals (at least according to long-adopted norms). 1. If a news story is accompanied by a photograph, pay attention to the subject’s clothing. You can often determine the season this way (at least whether it’s summer or winter). 3. Often used are photos that appear on social media. Many sites generously note the social media account’s or page owner’s name. In their opinion, copyright is thus not violated. But practically it turns out that some user published another’s photo, pulling it from the boundless internet. By and large, editors couldn’t care less to whom the photo belongs, and they don’t even burden themselves with the idea that one should pay to use another’s work. But if you want to be convinced that a photo is not fake, it’s worth taking the time to find the author of the photo in social networking sites themselves. You don’t need to be very experienced to find out whether it inspires confidence or not. Check also the person who shared the photo. There are various information collection sources, and though many were created for US citizens, there are also those that are useful for residents of other countries. For example, Pipl.com, which was designed for searching users’ online trace. The program helps to identify the author, find the photo’s trace. It searches all US social networking sites. You need to search the first and last name in Roman letters. 4. I’m sure that many have already learned to use Google Image and check when and in what context a photo was used in the past. There are also other programs that help discover fraud. For example, JPEGSnoop, which you have to download and monitor the metadata of images. The program can be used for different purposes. For example, it allows you to find out whether the photo was edited or not, it makes visible errors in damaged files, and so on. The numerous data that these programs provide will be clear to those who know their way around the parameters of digital photos. While less-savvy users can get the essential information about the location and date of filming, and the camera used. If a photo’s metadata is unavailable, you need to examine the image’s details more attentively: the license plates on cars, weather conditions, landscape, style of clothing, advertising bulletin boards, buildings, stores… These details will help identify the location. And sometimes, bear witness to fraud. In all cases, be observant.